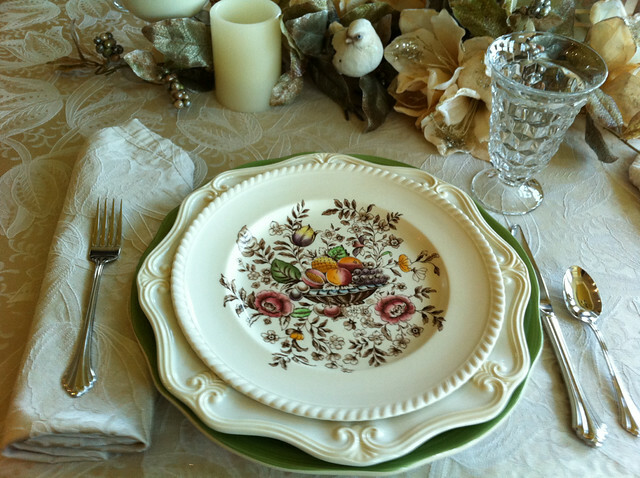 Now that the Christmas tablescape was replaced by the New Year’s Dinner tablescape, it is time to move on to another, “A Winter’s Day Tablescape”..I gathered several collections of dinnerware to create my table setting. 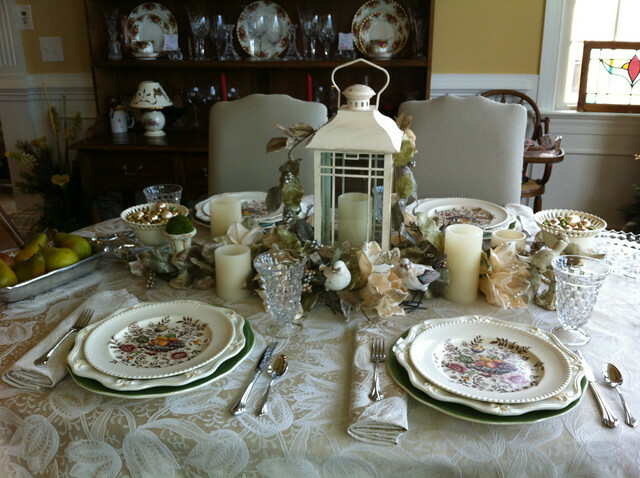 I used my Fostoria American stemware, and Waterford linens. 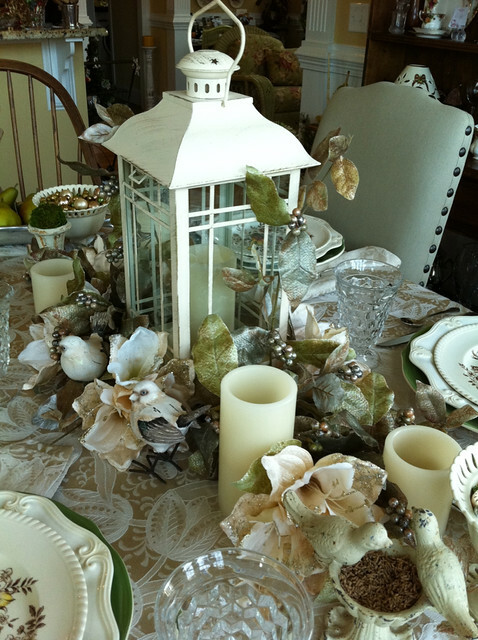 The lantern in the middle of the tablescape was a purchase from at after Christmas sale and I bought it at 75% off for a total of $9.00!..I purchased a larger one in the same design for $11.00. So a great find! 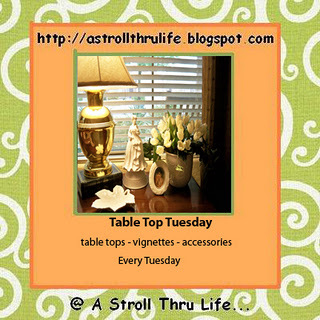 Hope you enjoy another one of my tablescapes! The lantern was a real deal purchased after Christmas for $9.00 (75% off) I feel as though I can use this all year round, so really a great deal. 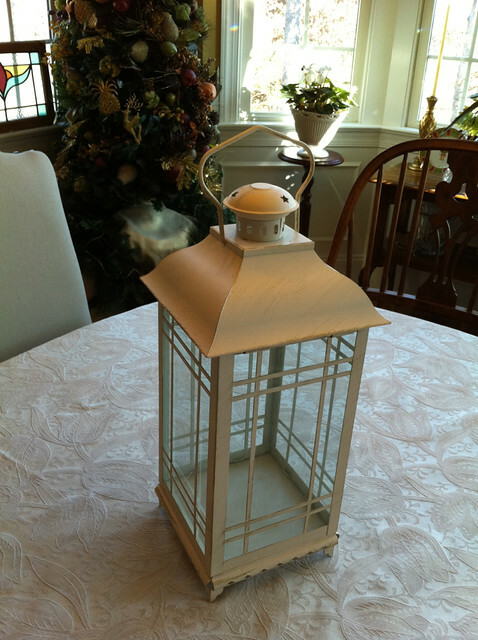 I also bought the same lantern but larger for $11.00! I placed my Lenox pineapple tray to add the silver and green colors. 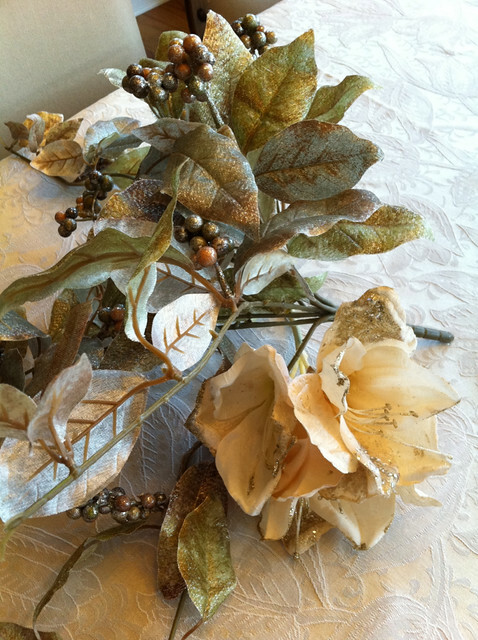 I added silk wintery leaves and a silk flowers to mimic the design in the tablecloth. And last, but certainly not least, is one of my birthday presents from my son, d.i.l, and granddaughter, a book that I was lusting after. I told the story to my daughter-in-law of how I entered a Christmas Decorating competition and the first prize for the best tablescape was this book. I did not win, but told her that I really wanted that book..she remembered…so what a great gift!..Love it! Please feel free to leave any comments..would love to hear from you! It is just lovely! 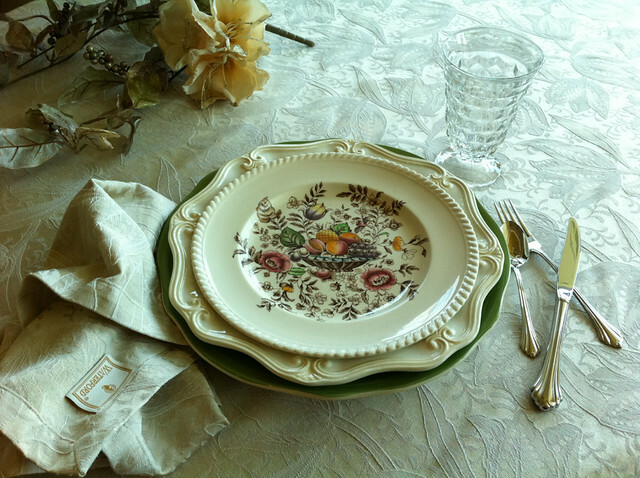 Love the salad plate and the stems, so pretty! 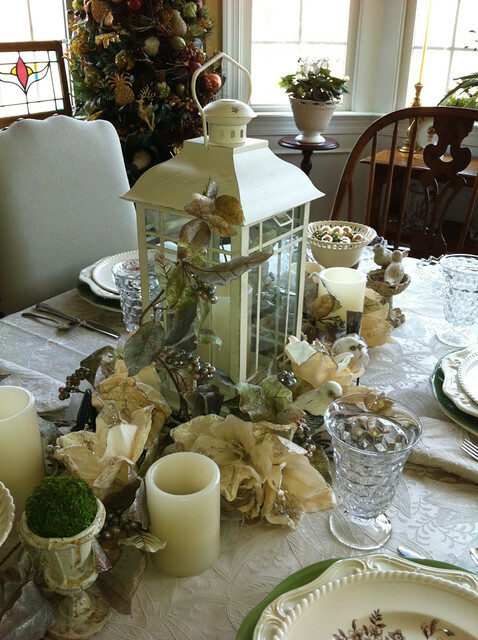 Yes, we tablescapers get good use from those lanterns, inside and out! The book looks great, enjoy it! Thanks Kathleen..a great compliment coming from an expert! 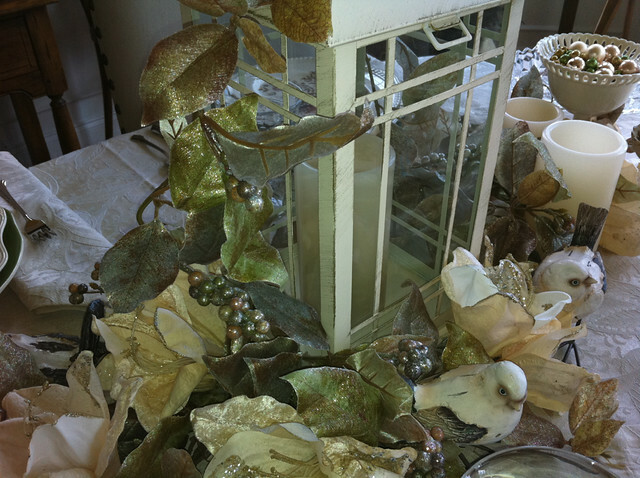 Another exquisite table by Shirley. 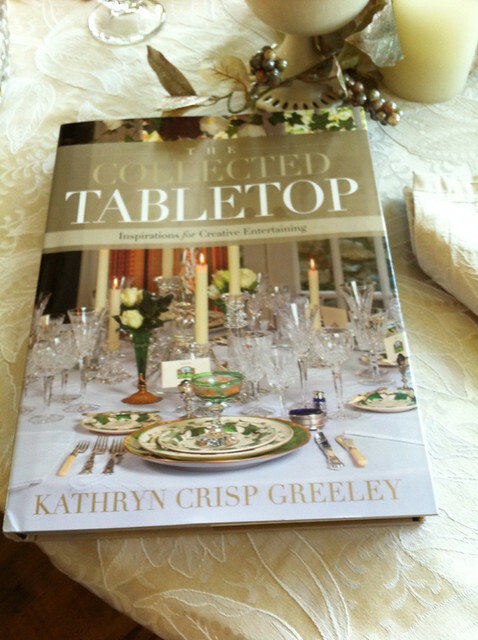 Interestingly, I met Kathryn Crisp Greeley when she was doing her book signing at A Southern Season before Christmas, and of course, my first thought was, Shirley could have written this book! You are so very talented! I am so bummed that I missed that signing!!! Love your latest tablescape and if I wasn’t suffering from spring before I looked at it, i definitely am now. It’s elegant but still very welcoming and makes me want to sit down and enjoy a leisurely dinner with you. Thanks for sharing the story of the book which according to Nate Berkus is one of the most thoughtful gifts you can give and receive. I totally agree. Thanks…I so appreciate your generous and kind comment…I just hate that I missed her book signing…It is a great book! I so like the subtle colour on your TS. Very elegant. The bird’s touch absolutely make the setting perfect. Love that lantern, Shirley! 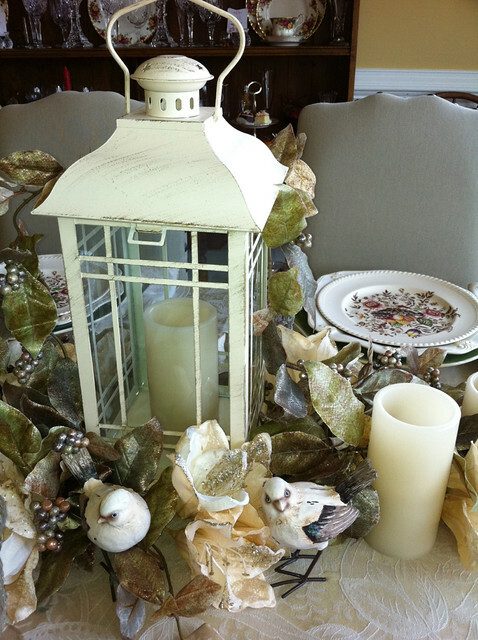 It is such a perfect compliment to the color scheme you have in your tablescape! So beautiful- and LOVE your lanterns! 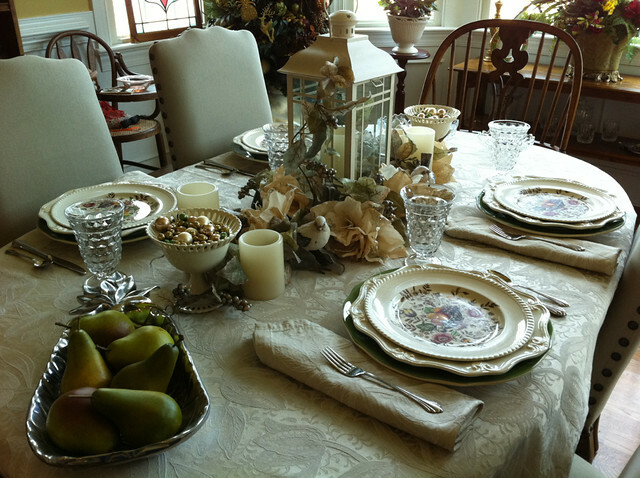 Oh, such a gorgeous tablescape! Love your lantern and little birdie. Pretty china too. Thanks for sharing and have a wonderful weekend. I adore tables capes and yours never disappoint! Thanks Stacy!! !…Again, love your new rug!!! Great table! It’s so wintry but not barren. The garland really brings it all together. Love those Johnson Bros. dishes. 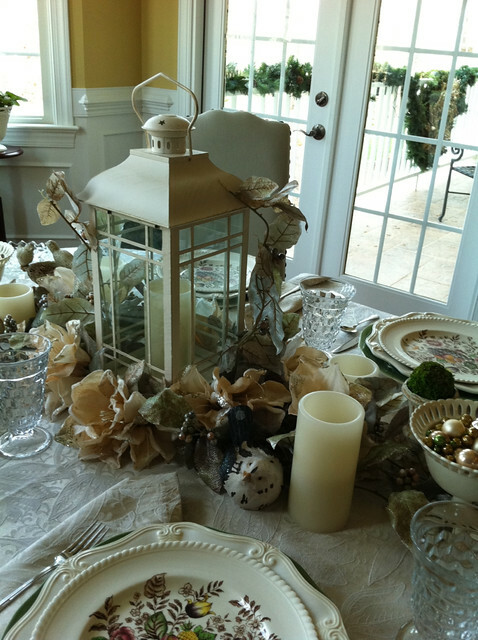 So glad that you brought this tablescape to Seasonal Sundays! Your table is just beautiful. I have not been here before. 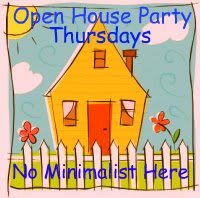 Saw you on Debbie Doos Linky Party. So glad I came. I’m going to follow you. 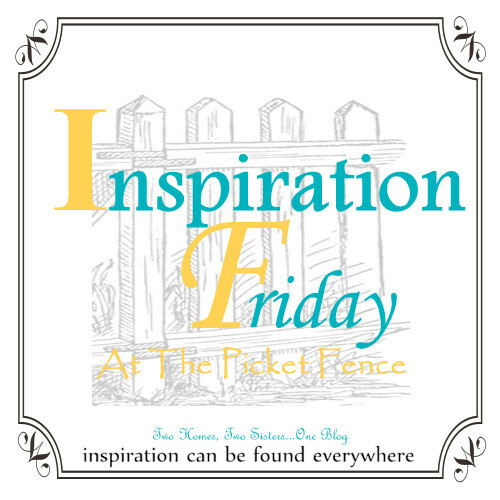 Really nice blog. 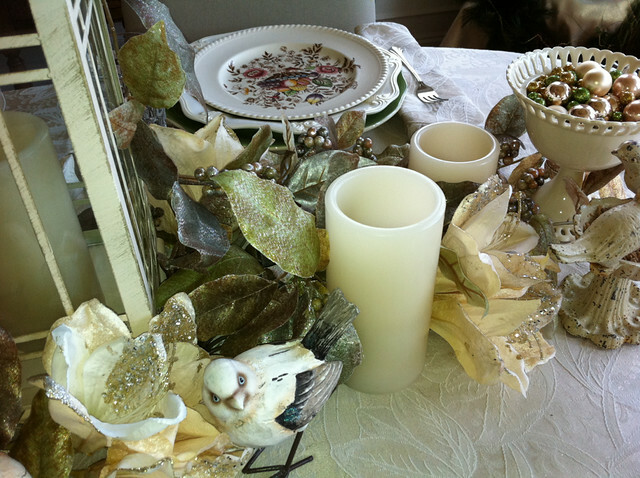 I love your simple, fabulous and elegant tablescape. It is indeed a wintery tabkescape, like it! It looks wonderful! 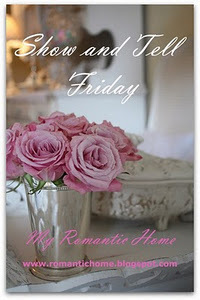 Thank you for linking it to Home Sweet Home! 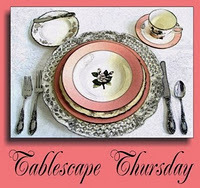 FYI: Your tablescapes are much nicer than the one on the cover!